Directions Surprise Stadium is located just south of Bell Road on Bullard Avenue, 1 1/2 miles west of the intersection of Bell and Grand Avenue (U.S. Route 60). To get there from the center of Phoenix, take I-10 west to Hwy. 101 north; from there either take the Grand Avenue or Bell Road exits and head west. You’ll pass through Sun City before you reach Surprise; follow the signs to the ballpark. Surprise is still a smaller suburb of Phoenix (with only 58,000 residents), and as such you’ll probably be spending a good chunk of your time in Phoenix. Surprise is on the far edge of the Phoenix metropolitan area, and it’s still an area in transition: it’s currently a mix of housing developments (the original Sun City development is due east, while new Sun City developments are within the city limits to the west) and big-box retailers. When Surprise Stadium opened, it was in the middle of nowhere. And while you can still see nowhere from the ballpark (just look past Sun City Grand to the west), there’s a lot more of note within a short drive of the ballpark than a decade ago. Chain restaurants close to the ballpark include IHOP (13734 W. Bell Rd., Surprise; 623/556-2151), Carrabba’s Italian Grill (14043 W. Bell Rd., Surprise; 623/214-3299), Pei Wei Asian Diner (14155 W. Bell Rd., Surprise; 623/546-6868), Paradise Bakery & Café (13959 W. Bell Rd., Surprise; 623/512-4684) Red Robin (14015 W. Bell Rd., Surprise; 623/556-90), and Applebee’s (13756 W. Bell Rd., Surprise; 623/544-0368), and there are several more chain restaurants at the corner of Bell Road and Hwy. 60 east of the park. Sure to be rocking on St. Patrick’s Day: The Irish Wolfhound Restaurant & Pub (16811 North Litchfield Rd., Surprise; 623/214-1004; irishwolfhoundpub.com). No, we can’t explain the inexplicable popularity of Irish bars in the Valley of the Sun, but the Irish Wolfhound usually attracts a crowd after a game. 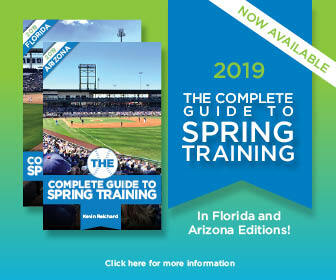 Where to Stay: Because there are so many spring-training venues in Phoenix and you’re more than likely visiting more than one ballpark, chances are pretty good that you don’t necessarily need to be staying close to the ballpark. Phoenix is a relatively easy area to make your way around, so don’t feel like it’s essential you stay close to the park. If you do feel compelled to stay close to the ballpark, there are several hotels within five miles of surprise Stadium, including the Quality Inn, Best Western Inn and the Best Inn. But remember: no one in Phoenix walks anywhere. They drive. Flying In: The closest airport is Phoenix Sky Harbor International Airport. It’s served by all the major airlines, including United, Delta, Air Canada, American, US Airways, and Southwest. It’s a pleasant enough airport.